If churches just did things his way, they'd be bursting at the seams again! Yeah, that's the ticket! People who didn’t grow up in the American evangelical bubble often don’t realize what they’re demanding when they ask an evangelical to accept a fact that is contradicted by their church’s interpretation of the Bible. To those bought in—excepting, perhaps, that small demographic of Christians who identify as evangelical and are truly progressive—evangelicalism is not a collection of facts. It is an entire reality, based not on logic but on a web of ideas, all of which must be wholeheartedly accepted for any of it to work. It is complete unto itself, self-contained, self-justifying, self-sustaining. It’s your community, your life, your entire way of thinking, and your gauge for what is true in the world. Evangelicalism feels so right from the inside. Oddly, that describes just about anybody who goes to a good college and finds out everything they knew was WRONG! If I were to argue with an atheist, the atheist could make the same complaint. But it's not the same thing (or it's okay) because we know fundamentalists are WRONG! The problem with Christianity is that it insists on humility. Where is the humility in insisting somebody else has it all wrong about anything, even Christianity? But is it really? Who died and left you in charge of everyone else's Christian beliefs? “He sat down and called the twelve and says to them, ‘If anyone wants to be ‘number one,’ that person has to be last of all and servant of all.’ "
That's in the Gospel of John, right after Jesus has washed the feet of all his disciples, an action one of my seminary professors described as the "sacrament that wasn't" because, while the eucharist became a lasting practice of Christian worship, foot washing waxed and waned and still makes us as uncomfortable as hell. Try to get 12 people from your congregation to sit still for it on a Maundy Thursday evening, and you'll have 12 people who aren't so sure they want to repeat the experience. If you can get 12, that is. In some churches you can, in some churches you can't; which churches are "right"? And who are you to judge, if you are busy being last of all and servant of all? The last doesn't get to judge, the servant doesn't pass sentence on the master. "Don't judge, and you won't be judged." It's really the only way out of that cycle of injury and response, just like "turn the other cheek" and "in Christ, we are all equal, Jew and Greek, slave and free, male and female" (a loose translation, I know, but it better serves my purposes). How can you judge when we are all equal? The story of the experience at Emmaus continues to fascinate me. 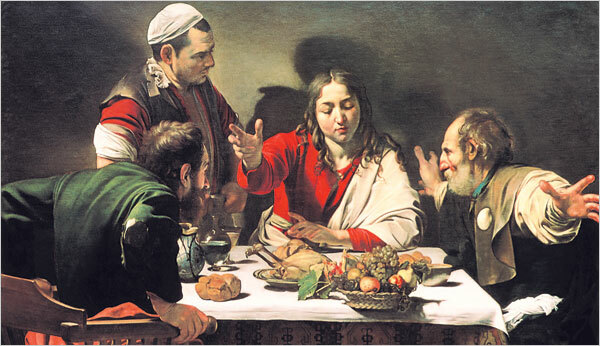 Caravaggio paints it as if, with a gesture, perhaps a familiar one Jesus was always doing, something his disciples and followers knew as a tic of the Master, they suddenly know who they've been talking to. And when they know, he disappears! But they are sure he was there, that he ate with them, that he walked with them, that he talked with them. How could they now know it? The story tangles up ideas of epistemology (how do we know what we know?) that lie at the root of the tangle of Western culture: Greek and Hebrew, discovery v. revelation. Do we discover all true knowledge? Or is true knowledge revealed to us? But the story also tangles up ideas of seeing as believing, because they do not see, but when they do, suddenly they believe! But believe what? Do they believe the victory of God over death? Or do they believe the power of powerlessness? Do they believe they have been empowered? Or do they feel true humility before God, who has revealed Jesus to them, only to take him away again? The Emmaus story is not about taking anything back; or claiming anything for the world, or even in the world. The Emmaus story is about God in the world, but how is God known now? Where is the thunderclap, the earthquake, the fire falling from heaven, even the voice some hear, some don't? Jesus was there and THEY DID NOT KNOW IT! Maybe because they weren't paying attention; maybe because they were too concerned with their own lives, their own interests, their own ideas about what should and should not be done now as followers of the man from Nazareth. They were asked to accept a fact contradicted by their own interpretation of the world, perhaps even of Torah, certainly of human experience: that the man they knew was dead was alive again. Maybe they were starting to think it was already high time they took the message of the Nazarene back from the people already talking crazy talk. Maybe they thought they had been laboring for years under false assumptions about who he was and what he was doing and they were facing a rude awakening upon learning the truth: Jesus was dead, and some of closest followers were losing their grip on reality. "This is my body, given for you." And then they see his body, or him, or know who he is; and then he disappears. That re-enactment of the eucharist is no small thing, but neither is the offer of hospitality. What did the Scriptures actually teach? Jesus tells them, but they do not hear. Only when he breaks the bread, only when he shares the meal, do they see. We want to be in charge; we want to discover for ourselves; we want to claim credit for being right. We are on the road to Emmaus; we should only be praying that our eyes will be opened. If we are truly humble, it is truly all we deserve. I can't much take Religion Dispatches these days. It is striking how often his closest friends didn't recognize him in the various accounts of the resurrected Jesus. I imagine the RD atheist nay-men choir would claim it was evidence that it was some kind of body-double hoax, not going past that to the incredibly radical change the experience made in the people who knew him both before his death and after. I've been looking at the citations of the canonical books, such as the citation of First Corinthians in Clement of Rome's epistle and it is striking how much they were willing to risk even in the second generation for what would be such an improbable seeming story. The story of religious disagreement is as old as the ante-nicene Churches, the various sects that came to such an unpleasant head in the various condemnations of various councils of bishops after Christianity became the state church of Rome, after the age of persecution ended and as there was something in asserting orthodoxy as various bishops - especially those of the Roman aristocracy and their allies used them for power. And as the Emperors decided they got to play a role in deciding things like which bishop got elected - something which is still an issue in, for example, China. Boy, hasn't Francis taken heat for his attempt to make peace over that one, though I suspect he has a good reason for having done so. Sorry, my thinking's a bit of random access, today.